It’s a bold move to bring public attention to an almost century-old tragedy that Armenian Americans say takes a back seat to other large-scale human rights violations: the killing of 1.5 million of their ancestors during World War I in what is now Turkey. But until now, the identity of those behind the signs was a mystery. Small wording at the bottom of the 672-square-foot billboards states only that they were “paid for by individuals concerned about the plight of Armenians.” They list no names. That’s because it’s not about publicity, it’s about bringing larger awareness to the issue, said George Pagoumian, 70, a Fort Lauderdale businessman and philanthropist who came forward only after the Sun Sentinel began researching the signs. The four billboards are located at Florida’s Turnpike-Interstate 595 interchange; and on Interstate 95 at Southern Boulevard in West Palm Beach, at Atlantic Boulevard in Pompano Beach and at Northwest 79th Avenue in Miami. And the campaign was organized and financed through Armenian community members, said Pagoumian, declining to list the other contributors or how much was donated. Twenty countries have officially recognized the killings as genocide, and those nations’ flags are on the South Florida billboard, under the words “thank you.” The United States is not among them — something Armenian Americans have fought passionately to change for years. They are pressuring President Obama to make an executive declaration. But calling what happened in Armenia almost 100 years ago a “genocide” is a very touchy subject — especially in South Florida. About 4,000 people of Armenian descent live in Broward and Palm Beach counties, according to the Census, alongside about 5,000 of Turkish descent. Turkey denies that Armenians were targeted because of race or ethnicity. Fuat Ornarli, past president of the Florida Turkish American Association, has not seen the billboards but dislikes what he considers a politicization of the issue. “I would like to express my deep sorrow to see such billboards around us, since this subject is so politicized, and so biased,” said Ornarli, of Miami. Genocide declarations should be made by scholars, not politicians, Ornarli said, adding that not all historians agree the Armenian deaths should be labeled genocide. Like the leaders of his native country, he said the deaths were casualties of war, exacerbated when the Armenians aligned themselves with Russia, Turkey’s enemy. Rosanna Gatens, director for the Center for Holocaust and Human Rights Education at Florida Atlantic University, said the removal and killing of Armenians by the Turks is taught along with the Holocaust and other modern genocides in the state-mandated human rights education program. Each year, a few teachers get complaints from upset Turkish parents “who think their children are being taught that Turkey is a terrible place,” she said. “It’s really important for people in our area to understand what happened in Armenia. All scholarly definitions say it was a genocide and we need to quit playing politics,” she said. Marta Batmasian, a Boca Raton real estate investor and Armenian community leader, agreed. “This is a human rights issue, not an Armenian issue. We are not going to let history be buried,” said Batmasian, a former educator who sits on the state task force for Holocaust and human rights education. The South Florida signs are very similar to an effort run by Peace of Art Inc., a nonprofit founded by Armenian American artist Daniel Varoujan Hejinian. 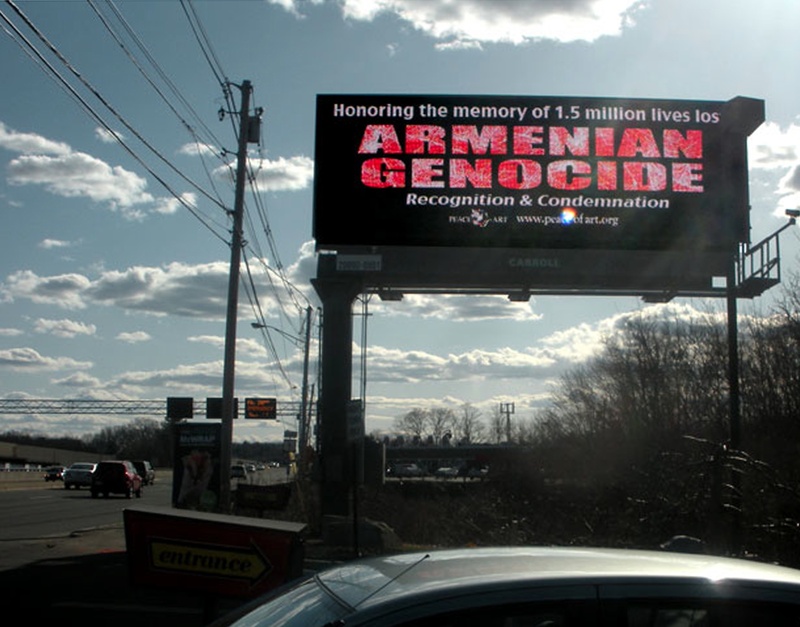 Since 1996, Hejinian has created and installed dramatic billboards each April in suburban Boston, his hometown, calling on the United States to recognize the killings as genocide. Rosario Teixeira, Peace of Art’s executive director, said the organization was not involved in South Florida’s efforts. “I am sure their efforts are well intended and we wish them good luck,” she said. Armenian churches and peace activists in South Florida every year host prayer or commemoration services on April 24, the day when the Ottoman government arrested 250 Armenian intellectuals and leaders, and began deporting them. St. Mary Armenian Apostolic Church in Hollywood will have a public service and commemoration Wednesday; St. Mary and St. David Armenian Apostolic Orthodox Church in Boca Raton trade off hosting the event annually. This year, the billboards created a buzz when the signs appeared but no one claimed the credit. Speculation ran wild among South Florida’s Armenians for weeks. “The emails I’m getting! They are saying something like this has never happened,” Batmasian said. The Rev. Vartan Joulfayan said his St. Mary’s parishioners last week were peppering him with questions about who the anonymous billboard contributors might be. The pastor told them it didn’t matter — that he assumed the donors wanted to stay out of the spotlight. This story originally appeared in the Sun Sentinel on April 21 and is reprinted with the permission of the author. Executive Director, Peace of Art, Inc.
During the month of April 2013, Peace of Art, Inc., will be displaying Armenian Genocide commemorative billboards to honor the victims of the Armenian Genocide, calling for recognition and condemnation of the genocide. Peace of Art, Inc. is a nonprofit educational organization that uses the universal language of art to address human concerns and to promote peaceful solutions to conflict. In Massachusetts, the billboards will be located in Foxboro, Watertown, and Cambridge. One 10′ x 30′ digital billboard is on display now on Route 1 in Foxboro, MA, 1/4 mile south of the main entrance to Gillette Stadium and Patriot Place. A second 11′ x 27′ billboard will be on display on April 1st in Watertown, on Mount Auburn Street in the heart of the Armenian community, close to the Armenian cultural centers and churches. In addition, a third 11′ x 27′ billboard will be on display on Cambridge Street, near Lechmere Station, East Cambridge. This area, with high traffic and high visibility, is the gateway between Cambridge, Boston, and Somerville. The 2013 billboard depicts the bloody hand prints on the words ‘Armenian Genocide’ over a black background. Since 1996, Mr. Hejinian has been calling for the recognition of the Armenian Genocide. In 2004 Peace of Art, Inc. began to sponsor the commemorative billboards honoring the victims and calling for the recognition of the Armenian Genocide. This year’s message further calls for the condemnation of genocide. To date, the Armenian Genocide has been recognized by over 20 countries and 43 U.S. states. However, in spite of his campaign promise to recognize the Armenian Genocide, in the last four years President Obama has failed to use the term genocide in reference to the slaughter of Armenians, which took place almost to a century ago. Once again we urge the President on his second term, to honor his first campaign promise. The Armenian Genocide is not a matter of concern for Armenians alone but to everyone. Genocide is a crime against humanity. Without recognition and condemnation, the Armenian Genocide remains a wound that continues to bleed, under the hand prints of the culprit. In a separate and ironically unrelated event, genocide billboards are being displayed in South Florida. 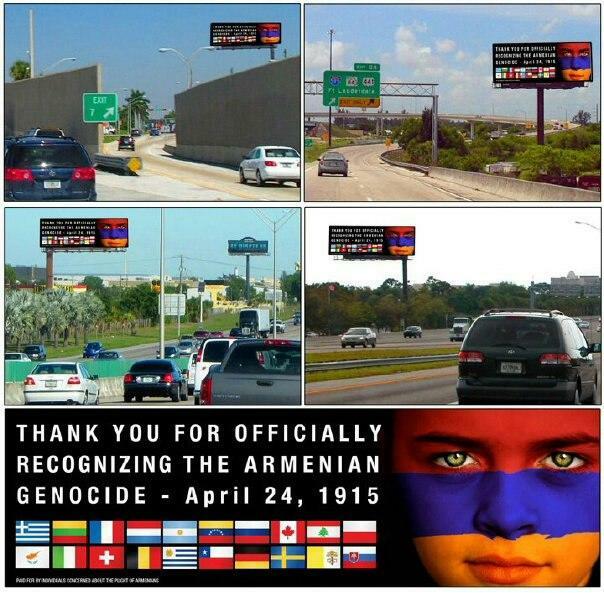 Paid for by “Individuals concerned about the plight of Armenians,” and displayed in South Florida are four 14′ by 48′ Armenian Genocide commemorative billboards on heavily traveled freeways to honor the victims of the Armenian Genocide, and to thank the countries that officially have recognized the Armenian Genocide. The billboards can be seen on I-95 in Miami-Dade, Broward and Palm Beach Counties and on the Florida Turnpike intersection with Interstate-595. Peace of Art, Inc. is not involved in the Florida Armenian Genocide billboards. This article originally appeared on Peace of Art, Inc. and is reprinted with the permission of the author. CORRECTION: This story was updated Tuesday, April 23 at 2:10 pm to clarify that the Massachusetts billboards are separate and unrelated to the South Florida billboards.